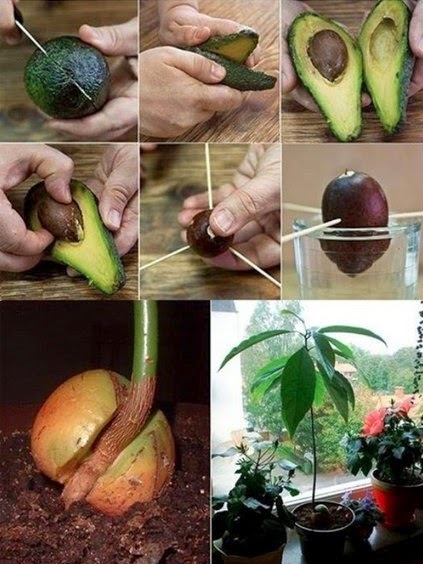 Here’s a step-by-step guide to growing your avocado tree. Avocados are highly nutritious and flavored, whether we’re talking about salad, guacamole, or straight up! They are a crucial staple for a nutritious and delicious diet. Try growing an avocado tree at home if you don’t like making regular trips to the grocery store for your daily supply of fresh avocados, can’t find organic ones, or are fed up with spending so much for quality produce. Placement: You’ll notice it is not a perfectly round shape. All avocado pits have a bottom and top side. The future roots will grow from the ‘bottom,’ and the sprout will emerge from the ‘top.’ You can easily distinguish which is which by noting the slightly pointier end, that is the top. On the opposite broader side is the bottom which has a flatter shape. It’s important to place the bottom pointing down so the roots will begin to gently grow in line with gravity. You want approximately the bottom 1/4 of the seed to be submerged. More on this later. Using a very sharp knife, you can cut off a thin slice of the top and bottom of the seed. This will considerably speed up the germination. Wrap in a very damp paper towel or cloth. Place in a covered dish and put it in a dark place for 2-4 weeks. The taproot is generally the first growth to emerge from the seed. Once the root is around 3 inches long skip ahead to step 6. Sunlight: Find a window with good sunlight and place it into a glass of water. If you live in the northern hemisphere select a southern facing window or if you live in the southern hemisphere a north facing one. This will maximize sunlight, especially in the darker months. Keep in mind that sunny windows are a good thing but direct sunlight all day long may be too much for this stage of growth and burn your fragile plant. Keep an eye on it and adjust your plant placement so that it gets plenty of light but not much direct sun. Maintenance: In order to observe when the roots start to grow, use a clear glass. It’s also useful for warnings of fungus and mold growth so if need be you can change the water immediately. It’s best to act proactively and change the water every 1-2 days, but you may be able to get away with changing it every 5-7 days. If you choose the latter, monitor your seed and act quickly if you spot any trace of mold. Wipe it off with equal amounts of water and sodium bicarbonate (baking soda). This will create an alkaline surface residue inhibiting mold/fungus growth which thrives in an acidic environment. Patience: Although many websites suggest a miraculous 2–4 weeks with the toothpick method, in many cases sprouting can take as long as eight weeks, so be patient and don’t give up! 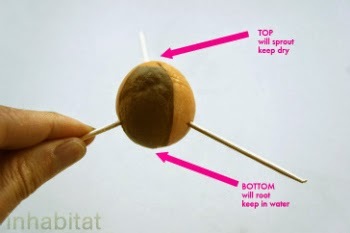 As the seed begins to sprout the outer brown skin will fall off as the top of the avocado pit will dry out and form a crack. The crack will become larger, and a tiny taproot will begin to poke out of the bottom. As the taproot makes its way down a small sprout will peek through the top of the avocado pit. It is very important not to forget to keep the taproot submerged. If you don’t your plant will die, and all of your attention and hard work thus far will be in vain. Soil: When you have well-developed roots about 2-3 inches long it’s time to pot your seedling. An ideal soil mixture for avocado seedlings is 1 part coco peat, 1 part perlite, and 1 part organic potting soil. A 6″ pot is a good size to get started. Plastic works, but clay or fabric are ideal. Add an inch or so of gravel or similar medium to the bottom to ensure proper drainage and airflow, and of course plenty of drain holes too. Pack the dirt well around the seed. Keep the soil fairly wet for the first week. After that water as described below. Give it frequent light waterings but don’t let the soil get muddy. If the leaves turn yellow, it means that the plant is getting too much water. Let the soil dry out for a couple of days, then return to light waterings. If the leaves get brown tips, it is not getting enough water. When you water, the key is to slowly and evenly water just until it begins to bead out the drainage holes in the bottom. Wait until the top 1/2 inch of soil begins to dry out and repeat. If deep trenches are created in the soil when you water it means you are pouring it in too quickly. Be careful not to water too much and make sure there is no standing water in the pot’s tray (empty it if there is). Avocado seedlings are highly susceptible to root rot. Plenty of drainage holes are a must and using a clay or cloth pot is a plus. If your plant appears to be wilting and dying of thirst despite watering it, it is likely that the roots are rotting. Your best bet aside from cutting your loss and starting over is to re-pot in a larger pot using fresh dry soil and wait a day or two before continuing to water (obviously using less water and more drainage holes than your original attempt). Spider mites may appear like magic within a day if you forget to water your seedling and it dries out completely. Of course it’s best to prevent this by keeping your plant watered, but if you happen to contract a spider mite infestation your best bet is to mist the tops and bottoms of the leaves with a mixture of water and a drop or two of dish soap in a ratio of about 8oz water to 1 drop of soap. Next, rinse your plant with plain water to get the soap off so the leaves can breathe. The soap water will help, but you should also order a package of live ladybugs right away to prevent the mites from taking over again. Ladybugs are natural predators and will feast on the mites as well as unborn eggs which will look like tiny white dots on the underside of the leaves. Additionally, you can order predatory mites as well which are highly effective. Aphids can be a problem as well but are a little easier to defeat. A very effective trick involves wrapping some tape around your hand, sticky side out, and lightly patting your infected plants. The aphids will stick to the tape, and you can then dispose of them. This beats squashing them by hand. You likely will leave some small aphids or eggs hiding on your plant. Use the “spray bottle dish soap method” above and saturate your plant. It’s a good idea to order some ladybugs too to clean up any loose ends and prevent further infestations. If you live in a warm climate that does not experience temperatures less than 45 degrees F, you can plant your avocado tree in the ground outdoors. Although avocado trees tolerate both acidic and alkaline soils, the best pH range for a high yield fruit-bearing tree ranges between 6 and 6.5; this slightly acidic range can be achieved by amending the soil periodically with lime or sulfur, depending on the pH reading. If you aren’t fortunate to live somewhere warm, don’t worry! Once the root ball in your first pot is fully developed and pulling the tree from the pot brings nearly all the potting soil with it, transplant it into a larger pot. It’s a good idea to make this your final move for quite some time by choosing as large of a pot as you can handle moving between indoors and outdoors. Simply bring your tree indoors and place it next to your sunny window before temperatures drop below 50 degrees F.
For the first year feed your tree an organic nitrogen-rich fertilizer, watering thoroughly in between feedings. Use about a tablespoon per gallon of water and go easy. Young plants don’t need very much. After the first year gradually increase your frequency of feeding with fewer waterings in between feedings. During the winter the tree will go dormant so fertilize just once every six weeks. If you found this guide helpful, please support us by sharing with friends and family. Together we can grow fresh food EVERYWHERE! This article (How To Grow Your Own Endless Supply Of Organic Avocados) was created and published by Why Don’t You Try This and is published here under a Creative Commons license with attribution to Why Don’t You Try This.